B.A.S.S. 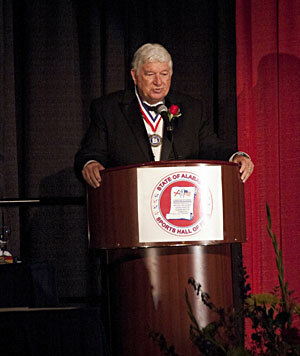 owner Don Logan was named the Distinguished American Sportsman for 2011 by the Alabama Sports Hall of Fame. Photo Credit: B.A.S.S. BIRMINGHAM, Ala. – Don Logan, one of three new owners of B.A.S.S., was named the Distinguished American Sportsman for 2011 by the Alabama Sports Hall of Fame on Saturday. Logan, an Alabama native and resident of Birmingham, was honored for his lifetime of contributions to sports, including his ownership of the Birmingham Barons minor league baseball team, his service on the Auburn University Foundation, and his recent purchase of B.A.S.S. He received the award during the induction banquet of the Class of 2011 of the Alabama Sports Hall of Fame. Also inducted were NFL stars Shaun Alexander, Jeff Rutledge and David Hill; Major League Baseball greats Frank Thomas and Al Worthington; Winter Olympics gold medalist Vonetta Flowers; Auburn University basketball standout Henry Hart; and sportswriter Jimmy Smothers. As the former chairman of Time Warner Inc.’s Media and Communications Group, Logan said he especially enjoyed overseeing the publication of Sports Illustrated, which enabled him to attend major sporting events through the world, and Field & Stream and Outdoor Life, which provided opportunities to fish some of the nation’s best waters. In his acceptance speech, he compared sporting events to fishing in that both activities form a bond between parents and children. “If you’ll take your kids on the water, I guarantee when they catch a fish they’ll remember that moment for the rest of their lives,” he said. Because of his love for bass fishing, Logan said he had dreamed of buying B.A.S.S. even before ESPN purchased the company in 2001. The dream finally was realized when he and two partners, Jerry McKinnis and Jim Copeland, bought the company in November 2010. He currently serves on the boards of Time Warner Cable, Auburn University Foundation, Birmingham Business Alliance and The Community Foundation of Greater Birmingham. Past Distinguished American Sportsman honorees have included B.A.S.S. founder Ray Scott, former President George H.W. Bush and entertainer Bob Hope.